Every gift we receive, no matter the size, makes a difference in the level of life-changing care our supported organizations provide our community. All it takes is a donation to the Suncoast Hospice Foundation. Contributions directly impact those seeking the support and services of Empath Health. With your support, we can continue to make a lasting difference in the lives of people who need us the most. Your Suncoast Hospice Foundation gift stays close to home. You can make a difference in your community – all it takes is a donation to Suncoast Hospice Foundation. Chances are that your family or someone you know has already benefited from services we offer. If you would like to make a donation in honor/memory of a loved one, we will send the family a certificate recognizing your gift. If you would like gifts to be made to Suncoast Hospice Foundation in lieu of flowers, please indicate those wishes in your loved one’s obituary. The Suncoast Hospice Foundation’s recognition of major and meaningful gifts is an essential expression of the gratitude that creates awareness of the financial support the Foundation has received from our community. Outright gifts to the Suncoast Hospice Foundation are the quickest and easiest way to make a gift – and they can be put to work immediately to impact the lives of our patients and families. A few of our major gift recognition opportunities include commemorative plaques installed in one of our community service or care centers for gifts of $1,000 or more; Circle of Caring membership for those giving $1,000 or more annually; or naming opportunities for those giving $25,000 or more. The purpose for gift naming opportunities is to provide recognition to donors that have made gifts to the Suncoast Hospice Foundation by having appropriate rooms and buildings named for them. For information on existing naming opportunities or how you can make a major gift to impact the lives of our patients and families, please contact us directly at (727) 523-2441. The Monthly Giving Club makes supporting the mission of Empath Health easy through monthly automatic withdraws from a credit card or bank account of your choice. You can get involved for as little as $5 a month. Set-up your monthly donations online or call Karen Van De Putte, planned giving director at (727) 523-3422. Women’s Giving Network members inspire and empower women to fulfill their philanthropic potential in order to create or expand innovative programs and services of Empath Health. Members gather annually to evaluate the needs of Empath Health and decide where to distribute their gifts through the Suncoast Hospice Foundation. Membership requires a minimum commitment of $1,000 per year for two years. For more information on this program, please contact us at (727) 523-2441. The planned giving program allows you to leave a legacy gift in support of Suncoast Hospice Foundation. Planned gifts are usually deferred gifts that Suncoast Hospice Foundation receives at the end of the life of a donor. These gifts allow us to continue providing comfort and care to our patients and their families well into the future. There are many options for planned gifts. Contact Karen Van De Putte, Planned Giving Director at (727) 523-3422 to discuss any of these options further, in the context of your own personal circumstances. When your company partners with Suncoast Hospice Foundation to sponsor an Empath Health event, you are helping us continue to provide life-changing care to your family, friends and employees when they need us. Sponsoring an event is also a wonderful marketing opportunity for your organization to partner with a reputable, community non-profit that has been caring for our community for more than 40 years. Listed below are the annual Empath Health events that are managed through the Suncoast Hospice Foundation. We have various levels of sponsorships for all size companies and are happy to meet with you to discuss the best fit for your organizational goals. In addition to the annual events hosted by Suncoast Hospice Foundation to directly benefit the member organizations of Empath Health, many community organizations host their own events and present proceeds to Suncoast Hospice Foundation to support the programs and services of Empath Health. Please contact us at (727) 523-2441 for more information about corporate sponsorships and community events. So much of what we do is successful due to the participation of our invaluable volunteers. With so many events to host and support throughout the year, we are always in need of volunteers to help out. If you’re interested in volunteering at an event – or participating in or donating to an event, please contact us at (727) 523-2441. When you donate items, shop for merchandise or volunteer your time to work at one of our Resale Shops, you directly support the mission of Empath Health. Not only do the proceeds of our Resale Shops go back into supporting programs and services of Empath Health but when our patients, clients and participants have needs they cannot meet, the Resale Shops provide them those necessary items at no cost to them. For more information on our Resale Shops. 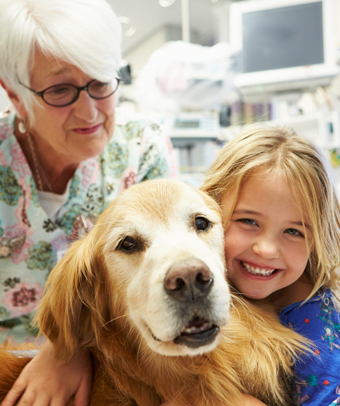 Your support helps provide special services like Pet Therapy. Our patients benefit immensely from the extra support of these programs.